May Theme: Vegetarian Bento Contest! The contest is now closed. Thank you so much every one who entered! The voting and selection process will be announced soon. The April theme didn’t really go too well, and it’s my fault (see why here.) But it’s a new month! 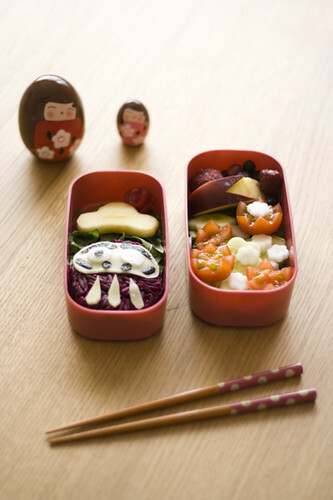 After much consideration, the monthly theme/contest for May will be: Vegetarian bentos. May is a great time for spring and early summer produce throughout most of the Northern hemisphere, so I think it’s a great time to get creative with our vegetables. Southern hemisphere bentoists can jump in with cold weather vegetables. Even if you aren’t a vegetarian all the time, it’s never a bad idea to eat more vegetables. I’m not a vegetarian myself but I try to make at least 40-50% of my bentos meat-free. The main goal is that by the end of this month, we’ll have lots of ideas and recipes for vegetarian bentos from the community! This contest is open to anyone in the world! Enter complete vegetarian bentos with a photo of the bento, OR individual bento friendly (holds up well until lunchtime, and tastes good at room temperature) vegetarian recipes, also with a photo. For recipe entries: Only your own recipes please, not ones copied from books or other sites. You can post your entries on your own blog, in the forums here (e.g you can post your recipes in the Bento Recipes Cookbook), or in the Just Bento Flickr pool. You must reply to this post with the URL for your entry blog post, forum post or Flickr photo page. A link back to this post would be helpful too, as well as a sentence in your post or title clearly saying that it’s an entry for this contest. Your entry/comment must be posted on or before 23:59 CET on May 31, 2009. 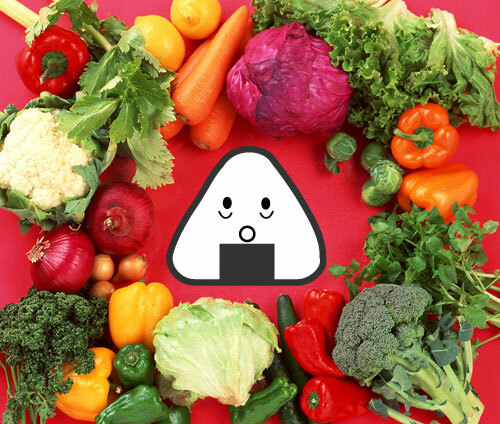 Entries will be judged by the Just Bento community by secret ballot. The winner will be announced in mid-June 2009. One lucky winner will win a $50 shopping spree in the online store of newest sponsor, From Japan With Love. 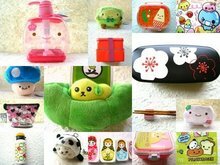 If you’ve ever perused the From Japan With Love site, you know that Sofia has a knack for choosing the most adorable bento products and other goodies from Japan. Here’s your chance to fulfill your kawaii-loving urges! Re: May Theme: Vegetarian Bento Contest! Great contest, Maki - I'm looking forward to seeing some new veggie bento ideas. I've posted my first bento of the month over on my (otherwise rarely used) blog: http://arjedre.blogspot.com/2009/05/todays-bbq-lunch.html The quinoa salad is one of my favorite spring dishes - it's just cooked quinoa tossed with chopped red/green peppers, tomatoes, green onions, cucumber, mint, and parsley and then tossed with a lemon vinaigrette. I am a pescatarian, but want to give vegetarianism a serious try. This contest will support my transition. I can 't wait to get started. 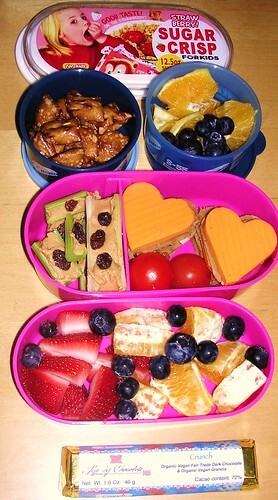 I'm thinking that as a moderator I should be disqualified from entering this contest - but I'm posting a bento anyway. I had great fun trying to scrape up something out of not very much. I got back from Australia on Friday night, stopped to get some milk on my way home, and haven't left the house since. No veges available, nothing fresh at all. If it wasn't for this contest I'd have just thought "bugger it" and bought my lunch. I'm even considering transitioning a little too. Here's my first bento of the month. I can't wait to make more and see everyone else's creations. Unfortunately, I'm unable to take part because I have to use up the dried ebi and chirimenjako that have been sitting in my freezer for almost 1.5 yrs!! I brought them over from my hometown and it would be a waste to throw them away.. This is why I should check the forums when I'm not at work... I just made about 6 portions of sticky rice with chinese sausage. Oh well. The Boy can eat them or they can languish in the freezer a little longer than expected! I am entering one too, although it's simple - it's vegan. I was very happy with my bento lunch today, which was even vegan :) So I'm hereby entering it into the contest. So far my most successful Bento (though I've only made 5: this week was a holiday week and I just discovered this site last week). All of my Japanese coworkers were impressed. It was an italian based theme, with a japanese twist (since my goal is cheap food in Japan). I had a chrysanthemum, cabbage, and cucumber salad, with some black sesame seed decoration and a sesame seed dressing (in the little fish container). Komachibu (used the panfried komachibu recipe on this site as an inspiration) flavored with fresh roasted garlic, basil and tomato sauce. I didn't get any of the browing effect, but they turned out quite tasty. Then as my grain: spaghetti with olive oil, blanched mixed peppers, parmesan, basil and salt. So are moderators eligible? I haven't bento-ed much in ages. It's too cold to be in my kitchen at 6 AM these days. It's too cold to be anywhere except bed these days. It's too cold to EAT bentos these days. I've been having soup. Yep, moderators are eligible! Only people not eligible are me (Maki) and, if she is lurking, Sofia of From Japan With Love (obviously)! Pasta salad made with brown rice fusilli, olives and tomotoes with balsamic vinaigrette. Boiled egg completes that tier. Top tier contains, organic roasted pizza rollups, mandarin orange, candied ginger, pizza crust and cheese wedge. Carrot sticks. Thanks for the contest Maki! I've got quinoa salad, yogurt with fruit and granola, baby carrots, and sauteed spinach with tomatoes. Hopefully it's enough to keep me going until 6:00pm. - on the side: yogourt and mustard sauce for the potatoes. Yummy!!! Here's another entry from me. Natto with green onion, shoyu and mustard. Brown rice musubi with furikake. Bananas, strawberries and pickled pluots stuffed with candied ginger for desert. I do wish it was summer. Here's another entry. Sautéed Brussels sprouts and capers tossed in a bit of soy sauce and sesame oil, cherry tomatoes, tamagoyaki with Korean seasoned seaweed in it, a couple of baked falafels, pickled jalapeños, brown rice. I have another entry. Not sure if this qualifies as some of the items are from leftovers that I did not cook myself. Let me know and I will remove this submission if I am breaking any rules. Seasoned brown rice stirfry with tomato, olive and peas. Left over guacamole and pico de gallo with a corn tortilla. My first entry is not as exciting as I wanted, but I really lurve the prize on offer and so must enter to win! So here it is... the frugalist bento in some time! A very simple rice & kinpira bento, with fun protein-rich side dishes and some of Spring's very first strawberries! Am I being obnoxious for submitting obento everyday? Here's my lunch for tomorrow. I'm on a roll. Third entry, and it has little tiny brown rice onigiri in it. The cabbage is really just there to lift the eggs up so they don't rattle around, but I made a dressing with some sushi ginger juice in it to make it a bit more appetising. NOT an original idea - there's a sushi place not far from my work which makes a chicken and cabbage bento with a similar dressing. It would be an identical dressing if I could figure out what exactly they put in it apart from the ginger juice. I got 2kg of fresh salmon the other day and cured some of it in sugar, salt, lemon zest and dill, a la gravlax. I gave a little (and I mean little) bit of it to Yoshio (a Japanese guy with whom I work) to try. He took it home, and he and his wife liked it very much. Then they gave me a present of a couple of packets of bento cute things including two small onigiri moulds, one for cylindrical and one for triangular balls. Of course I needed to try them out, didn't I? I do wish there was some way of stopping him from giving me presents though, it makes you think twice about giving something little when you know you're going to get something larger back. Another entry, but this time it's a recipe. And it may not be allowed, because one of its ingredients is something already made. Just delete this if it doesn't qualify. And some of it is in a bento here. Another entry from me, this one experimenting with gluten free flour to make the best sort of birthday cake - PANcake! It's also on my blog (link below). Adult bentos: brown rice with umeboshi, rocket salad with sunflower seeds, soy sauce, tamagoyaki (no recipe, just egg and a bit of sugar), fried renkon (soaked in beetroot juice to make it pink for my daughter, who still didn't eat it! ), gold and green kiwifruit. Kids' bentos: Okowa from Maki's recipe (vegan), dried apricots, cherry tomato (daughter only, son doesn't like them), rocket, sunflower seeds, renkon and tamagoyaki. Does this count as one entry or four? They're notes. just at the top left of your picture there are a bunch of little grey things, one of which is "add note". If you click on that a wee square with a text box comes up, you can drag it to where you want it and type in the text box. Then save. And you don't need to use the comments boxes either - you should be able to click on an "edit" at the bottom of your pic and add a caption. The pasta is a simple mix of pesto and red pepper paste. The cheese is emental. I did a nice humous and pepper bagel lunch the other day, but had mislayed my camera. The next one was a succesful attempt at feeding creature a vegetarian bento, but was unfortunatley not during may. It's almost definatley inellegable, but may be of interest to anyone trying to convince fussy eaters that meat isn't entirely neccesary. Pasta and pinaple bento The pasta sauce is onion, pepper, chilli, garlic, spinach, and olive oil. All of which he "doesn't eat" and yet he has only once failed to eat the pasta dish containing all of them. The origonal dish (stolen of a local italian resteraunt) did contain bacon, but bacon is seldom in the house. It also contained breadcrumbs, but their only good with hot pasta. Hopefully they'll get a little better, too X3 Thank you!! 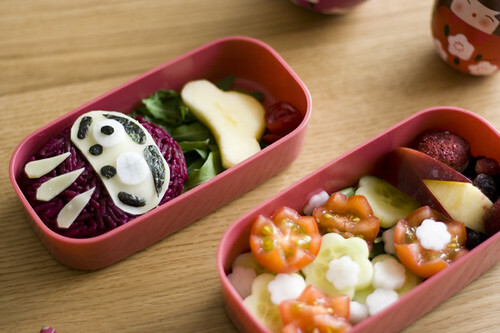 The vaguely flower-looking tomatoes are a HUGE step - I'm usually not so much with the bento art. Today's lunch was a little more appetizing looking on account of the good cooking I did this weekend. Lunch is packed in a "Fit n' Fresh" box that has two tiers separated by an ice pack. It's great for larger lunches that need to stay chilled or for runny items since there are two lidded containers. The only thing I don't like about this box is that it's not collapsible in any way - even when it's empty it takes up the same amount of space in my bag. Here's my entry. Thanks for organizing this! I have 2 entries today both with vegetarian curry and chutney. These are both 1st attempts at these recipes. I've seen some really nice bentos in the competition, and I felt challenged to do something a bit more imaginative that the usual vegetarian stuff I do (which has always seemed to involve tofu!). The korokke recipe I invented myself - I'll post it in the bento recipe cookbook forum (http://justbento.com/forum/beetroot-and-bean-korokke-recipe). If it's not against the rules, I'd like to enter this for the contest too, on its own merits as a recipe! There are a couple more photos after that which are close ups of individual boxes, I'm entering the big picture in the hope that I get bonus points for making four bento in one morning after not quite enough sleep! No recipes for this, all I did was boil the tofu and stir miso and water in with it. The potato salad was from the supermarket. I was going to add an egg but my husband was leaving for work, and I hate when he leaves without his bento! Today's lunch consists of mini black bean and spinach quesadillas with salsa, a banana, some baby carrots, and a bit of yummy cheese. Thanks to everyone who's shared pictures of beautiful vegetarian food - I look forward to catching up every time I post. Just got home from creche, and the kids hardly touched their lunches. Oh well, I'll try again tomorrow! This vegetarian bento was yummy and high-protein! I hope that's okay... Please, if I need to remove them, just tell me so and I'll gladly comply. Another one I didn't set out to make vegetarian, but decided to add the sausage on the side for dinner, then omitted it in the bento.